We’d love your help. 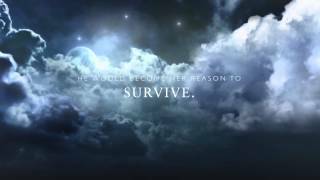 Let us know what’s wrong with this preview of Rain by Christie Cote. Rain is a really sweet read. After being approached by the author and reading the novel’s synopsis I must say I didn’t quite know what to expect but somehow I found myself intrigued enough by the possibilities that such ‘mysterious’ book description could contain to the point of needing to give it a try. It was an incredibly fast journey the one I took with this book, however not one I regret having. Honestly speaking, there’s nothing in this book I can actually relate too (and for that I am than Rain is a really sweet read. After being approached by the author and reading the novel’s synopsis I must say I didn’t quite know what to expect but somehow I found myself intrigued enough by the possibilities that such ‘mysterious’ book description could contain to the point of needing to give it a try. It was an incredibly fast journey the one I took with this book, however not one I regret having. Honestly speaking, there’s nothing in this book I can actually relate too (and for that I am thankful)—the core of this story is much more powerful, demanding and absolutely scary than anything I have experienced so far in my sort of young life, nonetheless, this lack of knowledge on my behalf didn’t stop me from connecting with the characters and from sensing some of the fears, desires and passions that Taylor, and occasionally even Kyle, felt throughout their ‘adventure’ in the fragile lines that separate the living from the dead like if they were my own. Taylor is an incredible girl and I think Cote portrayed her beautifully. Despite strongly believing that this is a story that will appeal mostly to the younger spectrum of the YA readers—and me being exactly on the opposite end of that—, I still see Taylor as a strong leading lady that indubitably ends up realising what it is that it’s important in life and what it is that it doesn’t deserve our worries and our time. As an adolescent, she makes both good and bad decisions and that sort of reality atmosphere of what happens to her and of how she fights it turns Rain in a really cute yet cruel read. I also very much enjoyed Kyle. I think he is a great male character as he is sweet, and kind, and even though he owes nothing to Taylor and to what she is going through he still decides to stick around and make her life a little bit more bearable—it is undoubtedly that everyone should have a person like Kyle as a friend or something more and I guess that’s one of the reasons, if not the reason, why I liked him so much. Unfortunately, I’m still not exactly sure on the purpose to the story of two of the secondary characters that show up in Rain, but I suppose that might also be because although I did found this book to be amusing I still felt a little bit old while reading it and, therefore, the chaos that these characters were intended to create didn’t exactly feel as violent and pungent to me as it would, maybe, to a younger version of myself. Also, I think a few more pages of plot would have helped in better developing some of the less fortunate decisions, reactions, moments of intensity in the book. "It's funny how one life-changing event could make you forget what happiness felt like." What would you do if you received life-changing information? Would you accept it and move forward? Would you cry and shut the world out? For Taylor Sullivan, these questions were going through her mind the day she heard the word "leukemia". She was weeks away from turning 16. She had a full life ahead of her. She was happy. She had great parents, an awesome best friend and a decent boyfriend. How could this h "It's funny how one life-changing event could make you forget what happiness felt like." What would you do if you received life-changing information? Would you accept it and move forward? Would you cry and shut the world out? For Taylor Sullivan, these questions were going through her mind the day she heard the word "leukemia". She was weeks away from turning 16. She had a full life ahead of her. She was happy. She had great parents, an awesome best friend and a decent boyfriend. How could this happen? The day after she found out her diagnosis, she met the one person that would change her world forever. Who knew that just sitting on a curb in front of a stranger house would make your day a little brighter? Taylor didn't know Kyle, so it made it easy for her to open up and talk to him. She couldn't even tell her best friend or boyfriend about her news. He felt safe and he didn't treat her like she was fragile. He gave her a little ray of sunshine in her clouded world. "There were kind, generous souls out there; it seemed rare to find-especially in guys my age." After letting everyone close to her know, Taylor decides to jump right into treatment. The quicker they start, the quicker results will happen. "It was in my body, not a monster in the closet. No matter where I was or how long I kept my eyes shut, it would still be there, killing me until I got the treatment to kill it first." With all the sick days, the medicine and the hair loss, there was one person that made each of these days better...Kyle. He was there through it all with her. He became her saving grace. He was everything she never knew she needed. "Sometimes in my darkness I found dreams where I wasn't sick, I had my hair and Kyle didn't want to be just my friend." Kyle, oh Kyle. I loved that boy! He's mysterious, but yet, you feel his love for Taylor. Who wouldn't love a guy that would stick by you through the worst possible moments of your life? Their relationship is just beautiful. For them being so young, they had to grow up so much in a matter on months. He needed her as much as she needed him. This book had funny moments, 'awww' moments and beautifully heartbreaking moments. I couldn't get enough of the pink highlights, iPod shuffles and lego houses. When Christie approached me with a request to read her book I did not really know what to expect. The short description was rather vague but it sounded mysterious of me to accept. And I am glad that I accepted her request! Otherwise I would have missed the chance to read this lovely book. We meet Taylor at the moment that her entire life is turned upside down. Nothing is and never will be the same again in her life. Through this events she learns who her real friends in life are and that nothing is ever what it seems. Taylor had to endure some things that I can never imagine myself going true and I hope that I will never have to, and I hope you guys won’t have to either. But what was remarkable was that Taylor all took it so well. She knew she had to be strong, not only for herself but also for the people around her that loved her. That’s probably why I felt an immediate connection with her. She was incredibly strong and down to earth. The decisions she makes throughout the book might not always be the smartest but that’s life. Sometimes all is good and the next moment all you can see is bad things. And Taylor experiences the good-bad alternation in a heartbreaking way. And then there was Kyle. Where should I began to tell how amazing this guy was? When he met Taylor she was a stranger but that didn’t take away that he wanted to take away her pain. Let her forget all the bad things that were happening to her at the moment, even if it was only for a short while. He stood next to her during her darkest moments, never giving her up like others did. Even though he only just met her. Everyone should have someone as Kyle in his life. His kindness towards others is one of the reasons I like him so much. But he also has a great sense of humor and his music taste is terrific. While reading Rain I wished that I could have the playlist he made for Taylor. So many great songs! But I felt like we didn’t know him at all, except from the time he spent with Taylor. The author didn’t mention anything of his past while it’s clear that he has one. But I suppose that we will get that background in the next book, at least that is what I am hoping for. beautiful you really have to read it for yourself: I watched the rain hurl itself against my window. Every so often I would see a flash of light in the darkness. The weather seemed to know how I felt and was displaying my sorrow outside. I felt compelled to go out and feel the rain against my skin. It felt like the sky was crying for me, even though I knew in reality that wasn’t true. When I read those lines I knew this book was going to be great. It’s so beautiful and somehow so poetic. Lengthwise Rain is not that long, it’s a little less than 200 pages but it feels so long – and that’s not meant in a bad way. Somehow Christie has written a 200 page book that feels like 4-500 page book – that is indeed a skill. I loved every part of this book, there wasn’t really those dull moments that generally seem to be in books. This was packed with emotional moments; sweet, sad, uplifting, depressing, hopeless, loving, intriguing – you name it. I don’t know if it’s sad that I could relate to Taylor, but I felt for her or rather; I felt with her. I could relate to her feelings, her thoughts, her actions – it felt as if I was her. The conversations with Kyle, the Stranger from across the road, made me laugh and whenever they were together I couldn’t stop smiling. I loved them together and I adored how he treated her. Can I just start by saying oh my goodness? Is that allowed? Round these parts in the bloggersphere I'm sort of in charge(who gave me that power, I'll never know) so I'm going to say it is. I say this a lot, but I really truly mean it this time, based on the synopsis I had no idea what to expect. Nada. Zilch. Not a clue. Something compelled me to want to read it though, that fateful day I was browsing Facebook and there was an author looking for some bloggers for her book cover reveal. "Hmm... That's nice." I thought. Cover reveals are such fun. Then I started to scroll past and then *light bulb* it hit me that, hello, I'm a blogger. So, I commented on her status and the rest is pretty much history. After learning a bit more about the book, I knew I absolutely had to read it, no question. So, after that story that y'all probably don't care about I have to say that I am so beyond happy that I did. I'm going to assume that because the synopsis is vague the fab Christie Cote wants to keep the major plot points hush, hush so I won't go into too much detail but I have to say that based on the few little quotes here and there I was able to see along the way before I read Rain that it is so much more than I thought it was going to be. This book is amazing. Just amazing. The characters are perfect in the way that they are absolutely imperfect which, you know, to me makes them perfect. I think I said perfect enough in that one sentence, don't you? This book instantly became a new favorite for me, and I cannot recommend it enough. Taylor, Kyle and everyone else were just instantly a part of me. I will take the characters in this book with me wherever I go. To me, that's something pretty special when a book just worms its way into your heart and takes root there. So, yes, Rain wasn't what I was expecting. But, what's the fun in reading if it doesn't throw you a few curve balls? From what I understand there are two more books planned and they are most definitely going on my to be read list, and I so hope you add Rain to yours. If you love amazing YA fiction, you will not be disappointed. This was another story I went into blind. At the beginning, you're introduced to this sort of gloomy character, Taylor, and her just as sad mother. Instantly, I'm curious as to why they're so depressing and if there was a death prior or something. Turns out Taylor has been diagnosed with a life-threatening disease that has basically changed her life along with her family forever. Once happy and carefree, Taylor's left with uncertainty of how things will work for her and whether she'll be able to This was another story I went into blind. At the beginning, you're introduced to this sort of gloomy character, Taylor, and her just as sad mother. Instantly, I'm curious as to why they're so depressing and if there was a death prior or something. Turns out Taylor has been diagnosed with a life-threatening disease that has basically changed her life along with her family forever. Once happy and carefree, Taylor's left with uncertainty of how things will work for her and whether she'll be able to survive this. Amidst her turmoil, Taylor meets Kyle, a young man who recently moved across from her house. Their first encounter was rather interesting if not funny, as she was just chilling in his territory. I liked Kyle. He was a refreshing character who stuck by Taylor regardless of the fact that she was ill. He didn't bail on her like what her boyfriend did. Speaking of the jerk. Austin. I'm somewhat unsure of his existence in the story as he didn't really matter to me. If anything, he wasn't really necessary because I didn't feel like he was a good match for Taylor even if Kyle wasn't in the story. Austin's character just didn't seem like the kind of guy Taylor would date, based on the kind of person she was. Then again, we aren't really sure of how she was before being diagnosed so who knows. Okay, back to Taylor and Kyle. Loved how they were from the beginning. I thought it was cool how he introduced her to different kind of music and kind of encouraged her to be more free. In a sense, he gave her strength to fight on and made her feel beautiful when she was at her lowest. Their blossoming relationship was sweet to explore. It was a lovely addition and I liked how his mysterious aura was broken down as well. I knew there was a lot going on behind the way he reacted to her bruises. I enjoyed this book. It was a very quick read, though the subject matter isn't exactly light. Taylor is given some information that would be heavy for anyone, let alone a teenager. As she struggles with this life-altering situation, she also is forced to deal with typical teen struggles. The journey she takes while coping with this is certainly heartwrenching. What I liked: Sadly, I think the way her boyfriend behaved was probably what a lot of teens would do in that situation. I'd like to think I enjoyed this book. It was a very quick read, though the subject matter isn't exactly light. Taylor is given some information that would be heavy for anyone, let alone a teenager. As she struggles with this life-altering situation, she also is forced to deal with typical teen struggles. The journey she takes while coping with this is certainly heartwrenching. What I liked: Sadly, I think the way her boyfriend behaved was probably what a lot of teens would do in that situation. I'd like to think that the world is just full of Kyles, but I would be kidding myself. I like the honesty. I was glad that I felt privy to the hell that Taylor was feeling, because it seemed, unfortunately, very accurate. And while I don't think I learned the lessons Taylor had to learn so young, I now know that the relationship shifts are very, very common. There were plenty of lighthearted moments to offset the more somber moments. The relationships between Taylor and Kyle and Taylor and Liz were entertaining and fun, amidst an unfortunate setting. I enjoyed the transformations that the characters had to go through to get through the mess that had been thrust upon them. What I didn't: At some points, I did think it felt a bit rushed. I liked that it was quickly paced, but at times it may have benefited from a slower pace. My only other complaint probably shows my age. There were times that I found myself asking why one character or the other was acting a certain way. Then I had to stop and remember that maybe ten (fine, who am I kidding, fifteen) years ago, I probably would have either acted or known someone who acted just like these characters. It was just a little hard for some reason for me to completely relate to Taylor, even though I certainly felt for her and her plight, and cheered for her throughout. I loved reading Rain. Rain is a great YA read. It is a very realistic book. It is definitely on of my top favorite books. Taylor should be worrying about planning her sweet sixteen birthday party, but instead she is battling cancer. Her best friend Liz stands by her side. Her boyfriend Austin seems to struggle with her being sick. Kyle the new guy from across the street in by her side through it all. Taylor meet Kyle when she is sitting in front of his house. He is easy to talk to. Kyle is a very I loved reading Rain. Rain is a great YA read. It is a very realistic book. It is definitely on of my top favorite books. Taylor should be worrying about planning her sweet sixteen birthday party, but instead she is battling cancer. Her best friend Liz stands by her side. Her boyfriend Austin seems to struggle with her being sick. Kyle the new guy from across the street in by her side through it all. Taylor meet Kyle when she is sitting in front of his house. He is easy to talk to. Kyle is a very great person. During the story Kyle and Taylor get close. Christie Cote does an amazing jog taking us through Taylor's battle with cancer. Rain is a very realistic read. Whether you have had personal experiences with cancer or not you will love this story. I absolutely loved this book! I’m the type of person that not a lot of books catch my attention, but this one did! I was able to get into it right away! Usually it takes me months to finish a book, even if it’s a good one. But this book I finished in 2 weeks! It was an easy read, chapters were short, and everything was easy to understand. The book is fiction, but once you read it, you feel like it could be a reality to somebody out there which is why I was able to picture myself as the main char I absolutely loved this book! I’m the type of person that not a lot of books catch my attention, but this one did! I was able to get into it right away! Usually it takes me months to finish a book, even if it’s a good one. But this book I finished in 2 weeks! It was an easy read, chapters were short, and everything was easy to understand. The book is fiction, but once you read it, you feel like it could be a reality to somebody out there which is why I was able to picture myself as the main character. If you like romance and any books by Nicholas Sparks, you will love this! Honestly this book is better than some of his I have read. I Highly recommend this book! Taylor Sullivan is a normal soon-to-be-sixteen-year-old girl with a normal family and normal life -- well, except for one thing. She just found out she has cancer. Taylor's world is turned upside down with the news, and she wonders if her life will ever be the way it was before. "I knew I couldn't hide from this. It was in my body, not a monster in the closet. it would still be there..."
When she returns to school the next day, Taylor's no Taylor Sullivan is a normal soon-to-be-sixteen-year-old girl with a normal family and normal life -- well, except for one thing. She just found out she has cancer. Taylor's world is turned upside down with the news, and she wonders if her life will ever be the way it was before. When she returns to school the next day, Taylor's not quite ready to tell her best friend or boyfriend about her leukemia yet, so she ditches and heads home. Sitting across the street from her house, she meets a stranger named Kyle, whom she uncharacteristically tells all her problems to, thinking she'll never see him again. Taylor feels better once she gets everything off her chest. But there's one problem: Kyle just moved in right across the street from Taylor. "Then I realized what he'd meant. I'd told my problems to a stranger I would probably see again." Shortly after their encounter, Taylor and Kyle strike up an unexpected friendship. It helps take Taylor's main focus off her upcoming chemotherapy, though it still lingers in the back of her mind. The day eventually comes; and it's not as bad as Taylor thought it would be, but it's not exactly a walk in the park, either. Visits from Liz and Kyle help ease the stress of being cooped up in a hospital for so long; but Taylor still feels like things just keep falling apart all around her -- especially when she finds out her boyfriend is seeing another girl. Can Kyle help her stay positive through this difficult journey, and is Taylor strong enough to overcome it? I had my hair, and Kyle didn't just want to be my friend." There were so many things I loved about this book. It had a steady pace and was fast enough to keep me interested but not too fast. I adored these characters, too -- except for Austin and a particular character at the end, that is. Another thing about Rain is that, aside from it being an amazing book, it had a beautiful story. There was a particularly poignant scene in the hospital that made me break down in sobs. Some books have a great concept but a not-so-great delivery. I'm happy to say that was definitely not the case with Rain. I don't want to spoil what happens, so I won't give any more details. But I will mention that one of my favorite aspects of the book was the links and information the author included at the end. I feel they'll really help bring awareness to childhood cancer. This was such an incredible book that I will definitely be re-reading in the future! This is a quick, not-too-heavy read despite it's serious subject matter. Taylor is just about to turn 16 when she is diagnosed with leukemia. She desperately wants to go back to before - before everything changed with that diagnosis. She doesn't want to accept it at first, and she doesn't even want to tell anyone about it - not her boyfriend, Austin, or her best friend, Liz. In that moment, she meets Kyle, a stranger - and she confesses everything to him. Sometimes it's easier to talk about your This is a quick, not-too-heavy read despite it's serious subject matter. Taylor is just about to turn 16 when she is diagnosed with leukemia. She desperately wants to go back to before - before everything changed with that diagnosis. She doesn't want to accept it at first, and she doesn't even want to tell anyone about it - not her boyfriend, Austin, or her best friend, Liz. In that moment, she meets Kyle, a stranger - and she confesses everything to him. Sometimes it's easier to talk about your problems to someone who has no stake in your life - I mean, you'll never even see them again, right? Only Kyle lives right across the street from Taylor, so....yeah, avoiding seeing him again might be a little on the tricky side. I watched the rain hurl itself against my window. Every so often I would see a flash of light in the darkness. The weather seemed to know how I felt and was displaying my sorrow outside. I felt compelled to go out and feel the rain against my skin. It felt like the sky was crying for me, even though I knew in reality that wasn’t true. She doesn't talk like that through the whole book. Really, on the whole, her narrative voice and the conversations she has with the other characters are handled pretty realistically. She only waxes poetic a few times - and I guess we all may do that from time to time. I also liked the way the relationships between the characters are drawn. I enjoyed this enough to read it in two sittings. 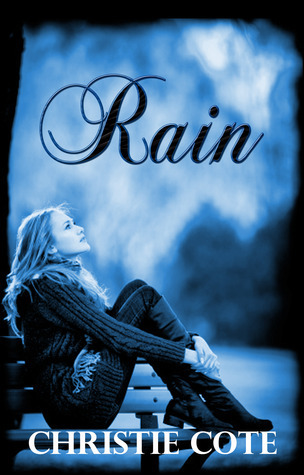 I found Rain to be a very touching, emotional read. Taylor is within weeks of turning sixteen when she is diagnosed with leukemia. She experiences several heartbreaking emotions after learning she has this disease and when she meets Kyle, he is able to bring her comfort. For the most part, I really enjoyed this story. Having had both my parents diagnosed with cancer (lung and ovarian) and after losing my dad two years ago, this book definitely had an effect on me. I was able to relate to many of the feelings and decisions that Taylor made and sympathized with her journey. I also found out a few things I didn't know about cancer and was happy that this book was so informative on the disease. I loved the relationship between Taylor and Kyle and the amazing connection they had. Kyle was hot, sweet, loving, a really great guy and absolutely what Taylor needed. I did however have a few issues with the story. First, in the beginning, Taylor is fifteen. During her initial meeting with her doctor, she does all of the talking. I would think that the parent of a teenager diagnosed with a disease like this would have questions or some input when discussing treatment or about the cancer itself. Instead, her mom says nothing! Even in the follow-up conversations, her parents don't seem to have much dialogue. As the parent of a preteen, I can't imagine not saying anything after learning of such a life changing event. I also had trouble with time frames. How long was Taylor in the hospital, how long in ICU? Another thing was that while I loved Kyle, I don't feel like I really got to know him. I'm very happy to see that the author is coming out with his story next. I am a true believer that people come into our lives at the right time for a reason. In Rain by Christie Cote, Kyle comes into Taylor’s life just when she needs him most. What defined this book for me was how unique Kyle and Taylor’s relationship developed. While most books introduce the tragedy behind the story towards the latter of the book, Christie delivers the bad news well ahead of the game and from there develops a once in a lifetime love between the protagonists. I was impressed with how well detailed her writing was and how it really highlighted every scene. I could picture everything she was expressing in every page. Though I loved these details, it always didn’t flow leaving it mechanical at times. It can’t be denied that Kyle’s character had undeniable charisma and a definite swoon worthy book boyfriend. Christie did a great job with his character; taking him from a complete stranger to someone you couldn’t picture the story without. The female protagonist in this book is Taylor. I couldn’t imagine how difficult it was for the author to have written her character. Taylor’s journey is not easy; it is the complete opposite in fact. I truly felt the sadness and the struggle she’s taken on. I didn’t however care for the obvious environmental stance. It’s not so much of where she stood but rather, I felt it was a bit inappropriate for a YA romance. That sort of threw me for a loop. I did love Liz, Taylor’s best friend. I thought she was a great secondary character. She added color and fun into this book. I do hope to see much more of her in the future. I thought this was a solid debut novel for Christie Cote and do recommend this to those who love a good YA story. This is a very emotional book. Taylor finds out she has cancer, and as she goes through Chemotherapy, her friends and family help her through it. Even a new boy named Kyle, who just moved in across the street. I read this book in less than 24 hours. I don't know if it was because the book is short, but that doesn't matter. It tugged at my heart strings in a good way. I felt like I was with Taylor every step of the way. THAT ENDING. MY HEART. While I do try to read diversely, I really stepped out This is a very emotional book. Taylor finds out she has cancer, and as she goes through Chemotherapy, her friends and family help her through it. Even a new boy named Kyle, who just moved in across the street. This story is amazing. It broke my heart sometimes. Taylor goes through many trials in her life. Kyle came into her life at the right time. He tried to make her life a little easier and happier for her. Austin in my opinion is a coward. Austin broke Taylor's heart but Kyle was there to pick up the pieces. Give this book a read I just know you will love it too. I really enjoyed this book! Once I started reading it I could not put it book down. Christie Cote is an amazing writer. I cant wait till her next book is released! A beautiful story. I laughed and cried. Review to come on the Blog Tour on May 15th 2014. Mom felt it deserved a 3 for self publishing. The story was not bad, but nothing original. The relationship was very teen. The hard part was the the illness came and went. It was the focus of the story and get it did not dig deep enough for mom to make it an amazing read. Of topic mom got so upset about the pesticides in fruit being the reason for the character getting cancer. It was just so frustrating for her, pesticides are not great but plenty of people eat fruit with it getting cancer, and Mom felt it deserved a 3 for self publishing. The story was not bad, but nothing original. The relationship was very teen. The hard part was the the illness came and went. It was the focus of the story and get it did not dig deep enough for mom to make it an amazing read. Of topic mom got so upset about the pesticides in fruit being the reason for the character getting cancer. It was just so frustrating for her, pesticides are not great but plenty of people eat fruit with it getting cancer, and it is not just fruit, and yet the author did not try to ever enlighten the reader or heroine on this not being the only food that has pesticide and the pesticides are no the only reason someone gets cancer. It was also personal for mom because she has digestive isssues and fruit is one of the few food groups she can eat. It just felt very misinformed, but for being a teen chick lit kind of book it was not bad. If you don’t take this book to seriously, and don’t have fruit basis, than you should give this book a try. I reside in Vermont with my Husband and our daughter. When I’m not reading, writing, or dreaming up my next story, I can be found shooting targets with my bow, drawing or baking. Rain is my debut novel.